The "energy charge hypothesis" assigns AMP regulatory metabolic functions in eukaryotic cells . AMP is a very sensitive metabolic indicator of cellular energy metabolism due to the function of adenylate kinases in cells. These enzymes interconvert two molecules of ADP to AMP and ATP . Because these kinases function at near equilibrium, the AMP:ATP ratio in cells varies as the square of the ADP:ATP ratio. When ATP is consumed or depleted and not adequately replenished, the ratio of ADP:ATP rises and drives the adenylate kinase reaction forward to generate ATP and AMP. The latter then further activates the AMPK pathway to conserve energy stores in cells. When cellular ATP levels are high enough and the generation of AMP is reduced, the former molecule preferentially binds to AMPK and blocks it . Because the affinity of ATP binding to the Bateman domain in the γ subunit is lower than that of AMP, relatively higher concentrations of the former are required to attenuate the function of the complex . The recent finding that only a small fraction of the total amount of cellular AMPK is amenable to AMP activation at any given time suggests that additional regulatory interactions, such as compartmentalization or covalent modifications (e.g., phosphorylation), are also involved in this binding process . Calmodulin-dependent protein kinase kinases (CaMKKs), the upstream kinases for calmodulin-dependent protein kinase I and IV, can also phosphorylate Thr172 and activate AMPK. CaMKKβ, rather than CaMKKα, is the main isoform of the enzyme that activates AMPK [34-36]. Because in many cases intracellular Ca2+ signaling often precedes energy utilization and demand, it is conceivable that CaMKKβ prepares cells for a significant increase of energy demand by activating AMPK . Transforming growth factor-β-activated kinase-1 (TAK1) directly phosphorylates AMPK in yeast . Recently, the mammalian TAK1 homolog (previously known as AMPK-kinase), which also phosphorylates Thr172 in AMPK has been found in various mammalian tissues, including skeletal muscle [38-40]. It has been suggested that tumor necrosis factor-α (TNF-α) and transforming growth factor-β activate TAK1 . In addition, 5-aminoimidazole-4-carboxamide-1β-D-ribofuranoside (AICAR) and the biguanide metformin also activate TAK1. This effect of metformin was lost in mice cardiomyocytes following the disruption of TAK1 expression . Further studies will ascertain the physiological function of TAK1 in cellular energy metabolism. Protein phosphatases 2A and 2C (PP2A and PP2C) inactivate AMPK by dephosphorylating pThr172 [33, 43]. The activity of these enzymes is negatively regulated by AMP and free fatty acids . AMPK phosphorylates serine moieties in target proteins. It mostly interacts with a serine moiety within a 9-amino acid motif. In human, this motif is Φ-Ψ-X-X-S/T-X-X-X-Φ, where Φ, Ψ and X denote hydrophobic, basic or any other amino acid, respectively [45-47]. Many of these target proteins regulate key metabolic functions, such as glucose uptake, glycolysis, fatty acid oxidation, cholesterol synthesis, glycogen synthesis, gluconeogenesis, protein synthesis or lipolysis . These various functions inhibit anabolic processes and conserve ATP, on one hand, and stimulate catabolic pathways to produce ATP, on the other . The activation of muscle AMPK by exogenous compounds or by contraction recruits GLUT-4 to the plasma membrane and augments the rate of glucose transport in a non-insulin-dependent manner [52, 53]. AMPK-induced translocation of GLUT-4-containing vesicles to the plasma membrane is preceded by the phosphorylation of the protein AS-160 at Thr642. This phosphorylated form of AS-160 releases the vesicle from intracellular storages and allows their recruitment to the plasma membrane [54, 55]. In addition, AMPK upregulates the expression of genes encoding GLUT-4 and hexokinase II and stimulates glycogen synthesis in muscles by allosteric activation of glucose-6-phosphatase-induced activity [56-58]. Various studies link the glucose transport stimulatory effect of AMPK in skeletal muscles to the activation of ERK1/2, p38-MAPK, Pyk2, PLD, αPKC and Grb2 . In addition to the GLUT-4 translocation, AMPK also exerts its anabolic function in skeletal muscles by activating two major citric acid cycle enzymes: citrate synthase and succinate dehydrogenase [59-61]. AMPK also stimulates glycolysis in cardiomyocytes (and hepatocyes) by activating 6-phosphofructo-2-kinase (PFK2) [62, 63]. AMPK (predominantly complexes with the α2 isoform) has a cardioprotective role in augmenting glucose transport and glycolysis in ischemic hearts [64, 65]. Increased myocardial ischemia injury due to enhanced post ischemic myocardial apoptosis, extended infarct size and worsened cardiac functional recovery were inflicted in mice bearing a dominant negative AMPKα2 in their cardiomyocytes . In non-insulin-sensitive cells that do not express GLUT-4, AMPK increases glucose uptake possibly by activating the ubiquitous GLUT-1 that resides in the plasma membrane . Although the outcome of insulin action and AMPK activation of the glucose transport system in skeletal muscles is similar, the transduction mechanism employed by insulin to recruit GLUT-4 to the plasma membrane is entirely different and independent of that recruited by AMPK. Indeed, when costimulated, both the AMPK- and the insulin-dependent pathway increase the rate of glucose transport in an additive manner . The interactions between these two main pathways that regulate glucose metabolism in skeletal muscles have been investigated . Disruption of the AMPKα2 function in skeletal muscles in mice resulted in glucose intolerance and insulin resistance, lending more support to the hypothesis that in addition to normal insulin function, the AMPKα2 isoform also plays a role in maintaining normal insulin sensitivity and reactivity of muscles . In cardiac muscle, however, insulin antagonizes the activation of AMPK by an Akt/PKB-dependent phosphorylation of Ser485 or Ser491 in AMPK α1 or α2, respectively, which attenuates the phosphorylation of Thr172 by LKB1 [70-72]. The observation that physical activity induces translocation of AMPKα2 from the cytoplasm to the nucleus supports the idea that AMPK also regulates transcriptional functions, such as the increased expression of GLUT-4 in exercising muscles [73-75]. AMPK phosphorylates histone deacetylase-5 and releases it from a complex with myocyte enhancer factor-2 (MEF2), rendering the latter accessible to threonine residues phosphorylation by p38-MAPK and allowing it to form an active transcription complex of the GLUT-4 gene . Figure 1. 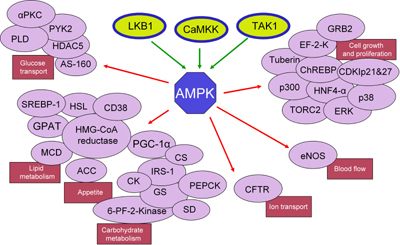 Metabolic pathways and functions regulated by AMPK. AMPK can be activated directly by three kinases, LKB1, TAK1 and CaMKK. When activated in various tissues and organs different AMPK complexes mediate a variety of cellular and physiological responses by activating cell-specific targets (e.g., enzymes, transcription factors and docking proteins). Major effects of AMPK activations are metabolic (carbohydrate and lipid metabolism), appetite regulation, cell growth and differentiation, vascular function (blood flow) and basic cellular functions (chloride ion transport). Abbreviations: ACC: acetyl-Co-A carboxylase. AS-160: Akt substrate of 160 kDa. CDKIp21&27: cyclin-dependent kinase inhibitors p21 and p27. CFTR: cystic fibrosis transmembrane conductance regulator. ChREBP: carbohydrate responsive element binding protein. CK: creatine kinase. CS: citrate synthase. EF-2-K: elongation factor 2 kinase. eNOS: endothelial nitric oxide synthase. ERK: extracellular signal-regulated kinases. GPAT: glycerol-3-phosphate acyltransferase. GRB2: growth factor receptor-bound protein 2. GS: glycogen synthase. HDAC25: histone deacetylase 25. HSL: hormone sensitive lipase. HMG-CoA reductase: 3-hydroxy-3-methyl-glutaryl-CoA reductase. HNF4-α: hepatocyte nuclear factor 4α. IRS-1: insulin receptor substrate 1. MCD: malonyl-CoA decarboxylase. p38: p38 mitogen-activated protein kinase. PEPCK: phosphoenolpyruvate carboxy kinase. 6-PF-2-Kinase: 6-phosphofructo-2-kinase. PGC-1α: peroxisome proliferator-activated receptor-γ-coactivator-1α. PYK2: proline-rich tyrosine kinase 2. SD: succinate dehydrogenase. SREBP-1: sterol regulatory element binding protein. TORC2: target of rapamycin complex 2. Pharmacokinetic data on metformin also supports the hypothesis that the liver is the main target for this drug. Orally administered metformin is effectively absorbed from the gastrointestinal tract to the portal vein. Thus, due to this first-pass effect, the liver is exposed to high concentration of the drug. Therefore, in contrast to skeletal muscle, the effect of metformin in the liver is mediated by LKB1 as the specific hepatic knockout of LKB1 in diabetic mice completely rendered them insensitive to metformin . Of concern is a recent report that links metformin-induced activation of AMPK to an increased biogenesis of Alzheimer's amyloid in mice brains . Therefore, novel AMPK-activating drugs devoid of such serious side effects are needed. Figure 2. D-Xylose and Compounds 19, 21 and 24 activate AMPK. A: L6 rat myotube cultures were washed and received fresh medium supplemented with 2% (v/v) FCS, 23.0 mM D-glucose supplemented with 20 mM of D-xylose (D-xyl), 5 μM of Compound 19, 150 μM of Compound 21 or 50 μM of Compound 24. These compounds were present in the medium for 40 min, 12 h, 30 min and 2 h, respectively. Control myotubes received the vehicle (V) only. AICAR (4 mM), 100 nM of insulin (Ins) and 0.25 M of D-sorbitol (S) were present for 1h, 20 min and 30 min, respectively. Whole cell lysates were prepared and Western blot analyses were performed with antibodies against AMPKα and pThr172-AMPKα. B: Human myotubes were treated as described above and taken for Western blot analysis of AMPKα and pThr172-AMPKα. Representative blot and a summary of n = 3 (* p < 0.05) in comparison with the respective controls. Reproduced with permission from . Figure 3. D-Xylose and Compounds 19, 21 and 24 activate AS160. Whole cell content of AS160 and pThr642-AS160 was determined by Western blot analysis in samples that were prepared from L6 myotubes, as described in the legend to Figure 1. Representative blot and a summary of n = 3 (*< p < 0.05) in comparison the respective controls. Reproduced with permission from . Figure 4. Molecular structures of AMPK activators sharing structural similarities to the D-xylose derivatives, Compounds 19, 21 and 24. Figure 5. Molecular structures of phytoestrogens that interact with AMPK. Momordicosides, such as maslinic acid, cucurbitane and ginsenosides represent another class of natural compounds that activate AMPK and may also possess antidiabetic properties (Figure 6). The main natural source of maslinic acid is olive's skin; the rest are extracted from Momordica charantia (bitter melon) [148, 149]. In addition to the four ring triterpenoidic structure, the majority of momordicosides contain one or more sugar moieties bound to the ring structure via glycoside bonds. The most abundant sugar moieties are β-D-glucopyranoside, β-D-allopyranoside and β-D-xylopyranoside. Several studies indicate that these compounds increased the rate of glucose transport and induce GLUT-4 translocation to the plasma membrane in L6 or C2C12 myotubes and in 3T3-L1 adipocytes by activating AMPK. 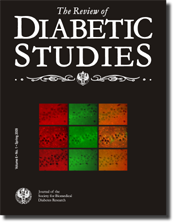 When tested in vivo, some momordicosides enhanced fatty acid oxidation and glucose disposal during glucose tolerance tests in insulin-sensitive or insulin-resistant mice or augmented glucose-stimulated insulin secretion in mice [149, 150]. In vitro studies suggest that ginsenosides increase AMPK phosphorylation and activity in 3T3-L1 cells; however, the relevant molecular interactions have not yet been ascertained . Figure 6. Molecular structures of momordicosides representing a class of natural compounds that activate AMPK. Figure 7. Molecular structures of compounds that have one or two phenol, polyphenol or phenolmethyl ether moieties. Figure 8. Molecular structure of the thienopyridone derivative A769662 and Compound 202. Figure 9. Molecular structure of the furanothiazolidine derivative, PT1, that interacts with the α-subunit of the AMPK complex. Figure 10. Molecular structures of AMP and structurally related compounds that induce allosterical activation of the AMPK complex. Reactive oxygen species (ROS) such as peroxynitrite (ONOO-) have been associated with the activation of AMPK in cells, especially in tissues with a high oxygen demand . Pathologically relevant concentrations of peroxynitrite are capable of activating AMPK independently of variations in the AMP/ATP ratio. It has been suggested that this process is significantly enhanced following hypoxia and reoxygenation in the heart . Similar AMPK stimulatory activity has also been assigned to the free radical hydrogen peroxide . The idea that activated AMPK prevents oxidative stress associated with diabetes by upregulating mitochondrial uncoupling protein-2 (UCP-2) presents an attractive pathway for antidiabetic effects of such AMPK activators . Similarly, the finding that nitric oxide (NO) per se activates AMPK via the Ca2+-dependent CaMKK pathway in vascular endothelial cells points to another mechanism for AMPK activation, especially in cells and tissues where this radical generation is increased due to an of induction of NOS isotypes. The inhibitor iodotubercidin is a synthetic adenosine derivative that has been used to inhibit AMPK in vitro. It should be noted that this compound also interacts with and inhibits other enzymes, such as glycogen synthase, phosphokinase A, phosphokinase C or casein kinase [190-193]. Acknowledgments: This work was partially supported by a grant from the Alex Grass Center for Drug Design and Synthesis of Novel Therapeutics (School of Pharmacy, Faculty of Medicine, the Hebrew University of Jerusalem), The Yedidut Foundation (Mexico), and DIAB R & D, France. S. Sasson is a member of the David R. Bloom Center for Pharmacy at the Hebrew University of Jerusalem. Does LKB1 Mediate Activation of Hepatic AMP-Protein Kinase (AMPK) and Sirtuin1 (SIRT1) After Roux-en-Y Gastric Bypass in Obese Rats?